﻿ Lana Del Rey Fan » » Lana Del Rey on Late Show with David Letterman Tonight! Lana Del Rey on Late Show with David Letterman Tonight! 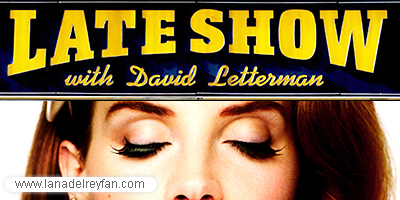 Don’t forget to watch Lana Del Rey on Late Show with David Letterman tonight! This will be the second performace of Lana in a U.S. show! The program is set to airs at 11:35pm ET/PT on CBS, to watch it via livestreaming, click here.